North Carolina. A key state. 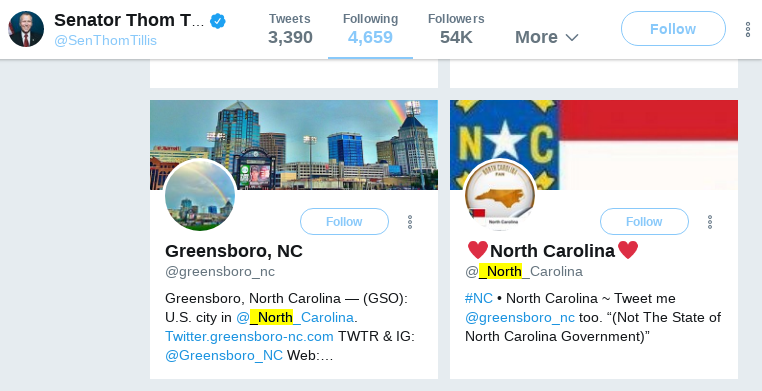 Why is Twitter allowing fake North Carolina state and county Twitter accounts to spread alt-right disinformation? This is a huge problem and we need your help. On Twitter, as on other social media, fakery is rampant. It leaves the door wide open for accounts to impersonate people and organizations, or to claim false credentials. For those who know how, Twitter accounts can be controlled with scripts. Accounts can be created, re-named, and re-purposed this way. Old, abandoned Twitter accounts that have been hacked are very valuable on the black market because they appear to be well established. Hijacked accounts can be sanitized by deleting old tweets and changing their handles, screen-names and imagery. 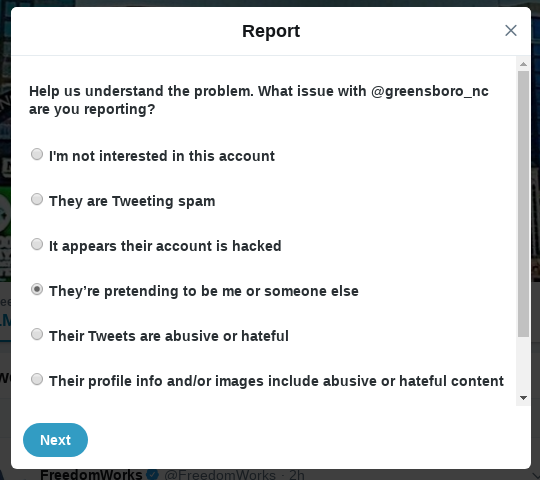 Once purchased, these accounts can be programmed to tweet automatically – for instance they might track a certain set of users and tweet pre-programmed responses to them. Often these accounts are fully or partially automated – programmed to retweet on a schedule from a list of high-profile accounts, for instance. This can give the account the appearance of being very active and engaged even when there is little to no real human effort behind this apparent engagement. Automated accounts are called “bots”. An example is the ReffyBot network we discovered and vanquished a few weeks ago. Sometimes accounts are partially automated and partially human controlled. This type of account – a bot/human hybid – is know as a cyborg. A cyborg account can appear quite legitimate and active, with a high number of retweets mixed in with real human interaction. 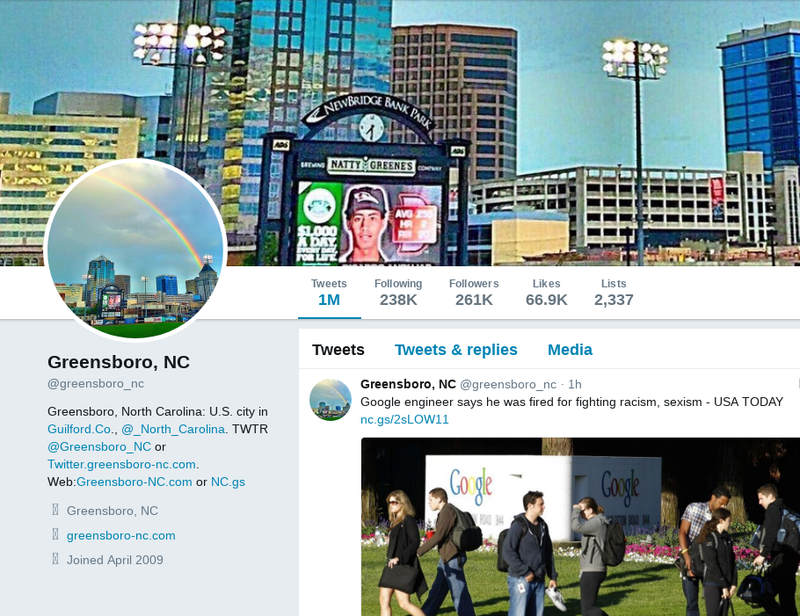 @geoffgolberg recently alerted us to a particularly disruptive network of cyborgs – high follower Twitter accounts that appear to be the official Twitter accounts for counties, states, and even the US itself. A few of these accounts now have disclaimers in their Twitter descriptions, but this is a new development. As recently as February, or later, these accounts were doing their best to look official. There were no disclaimers earlier this year, according to archive.org. Few people notice when an account changes its description. 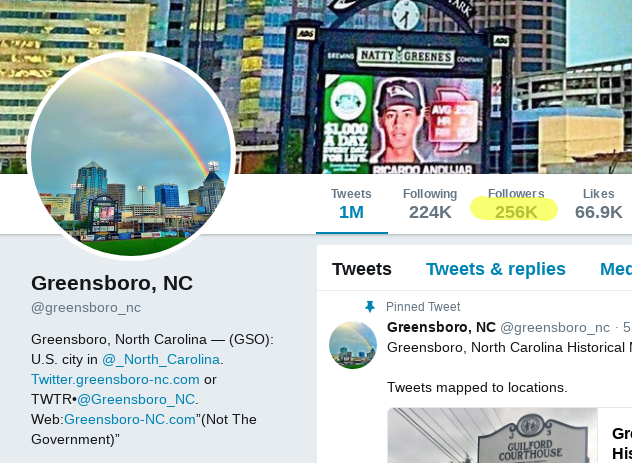 It’s likely that many of the followers of these accounts believe they are official. 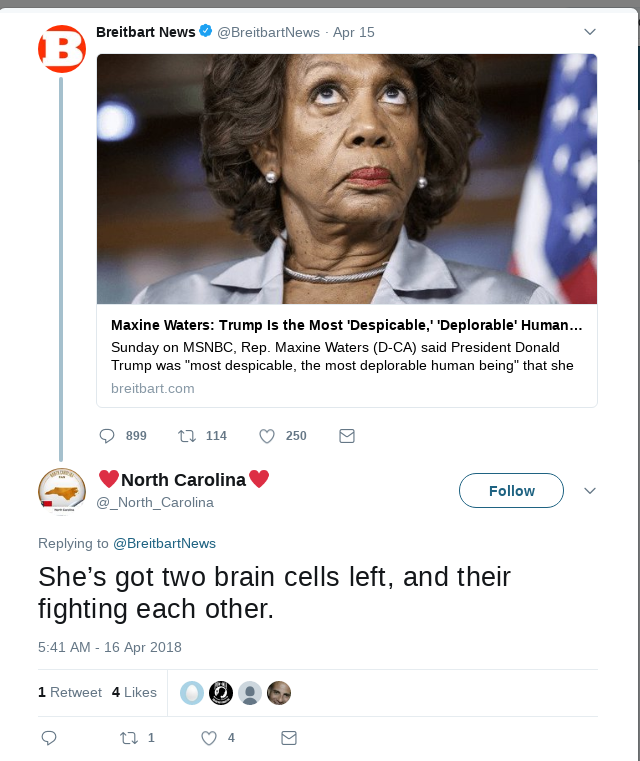 These accounts tweet decidedly right-wing content. For those that are unaware, this could create the illusion that North Carolina is far more right-leaning than it actually is. 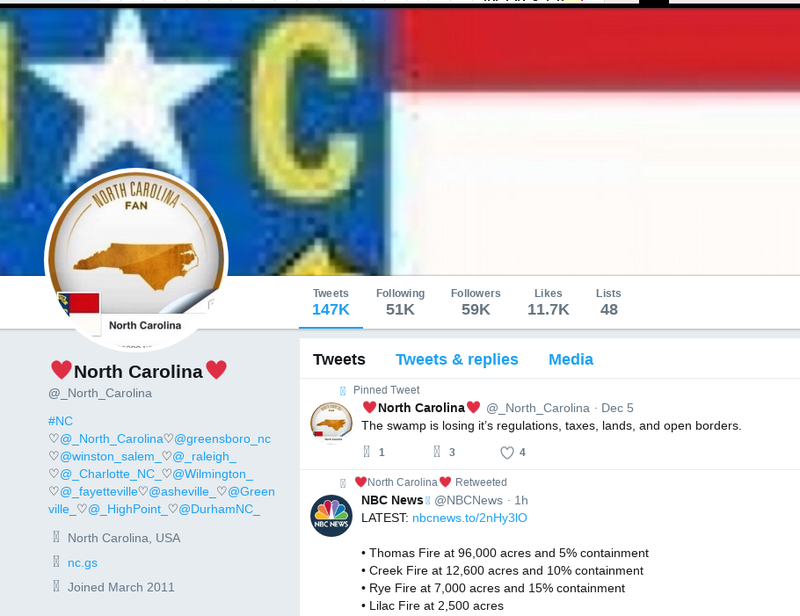 Here is a tweet that shows the account @_North_Carolina both impersonating the state of North Carolina and tweeting right-wing content. 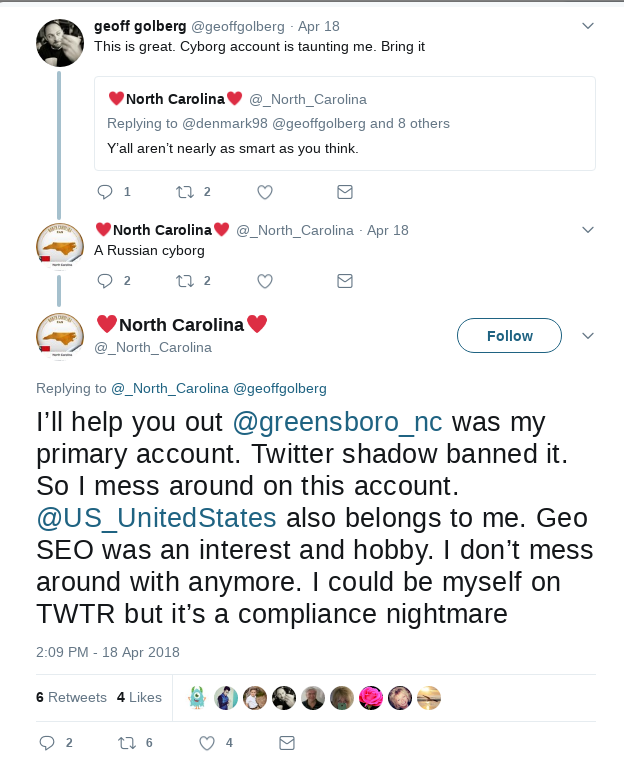 Our collaborator @geoffgolberg had this very interesting exchange with the human behind these accounts, here. 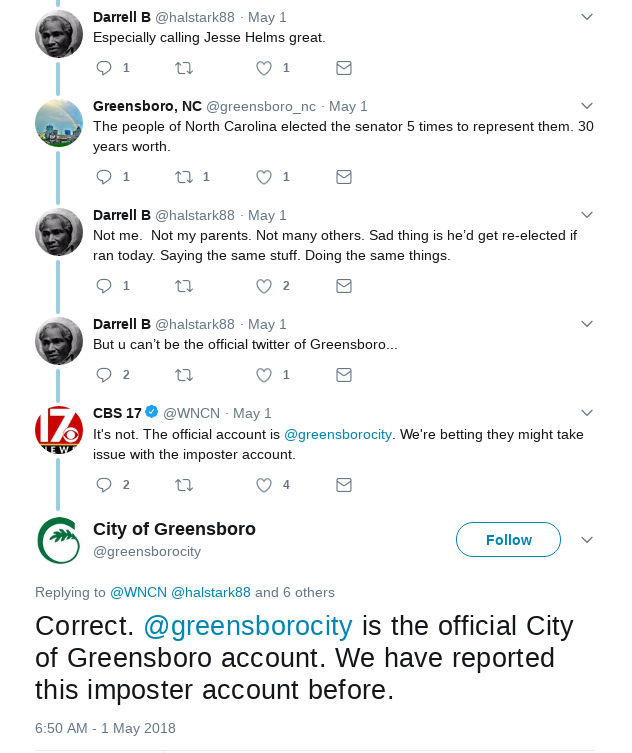 The official Greensboro account isn’t verified, so it is difficult for the casual observer to know which account is real. The official account has requested that Twitter remove the imposter account, to no avail. 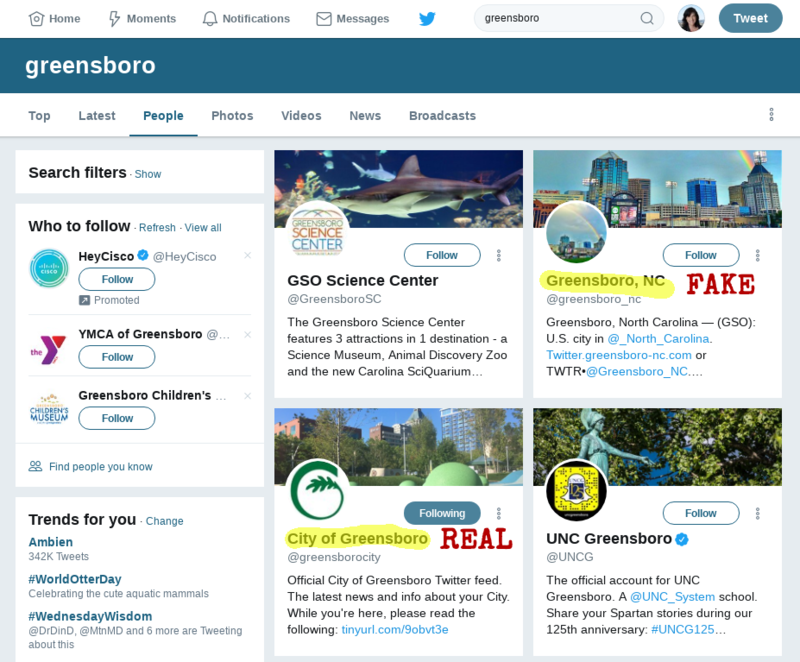 The fake account shows up higher in the search results for “Greensboro” on Twitter. 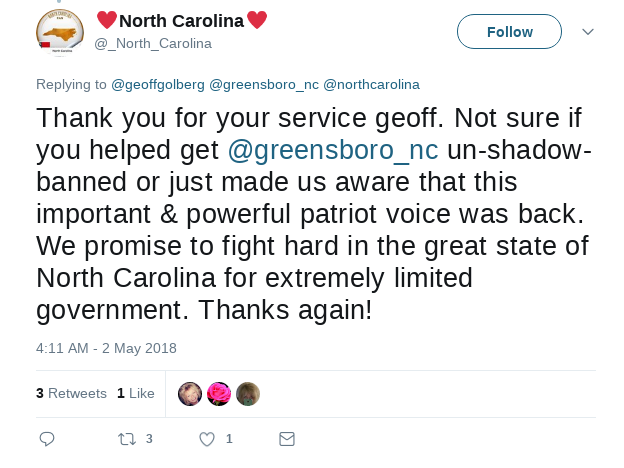 Also note, that the account’s description is cut off in these results, so the “Not the Government” disclaimer is not visible, but the link to the fake North Carolina account is. 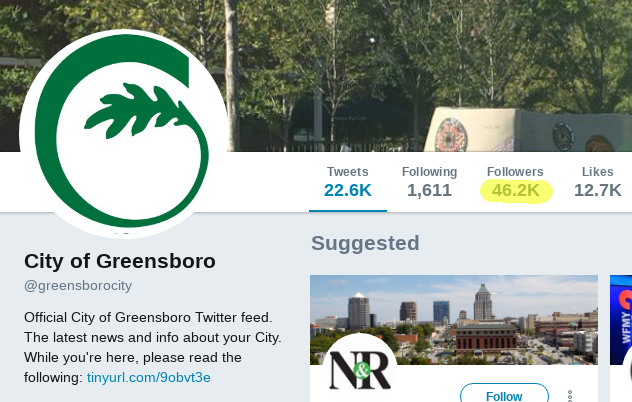 Is this why the fake Greensboro account has more than five times the number of followers as the real account? 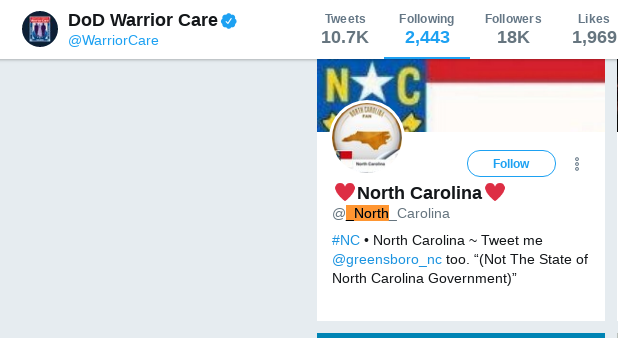 These followers include some very interesting official accounts, including @WarriorCare (official DoD account), @Interior (official Dept. of Interior account), and @LBJLibrary. Do they know they are following a right-wing imposter site? Even more interesting is Republican Senator Thom Tillis – @SenThomTillis. He also follows both of these accounts, and in fact began following them very early on. Well before he began following the official accounts. Mistake? 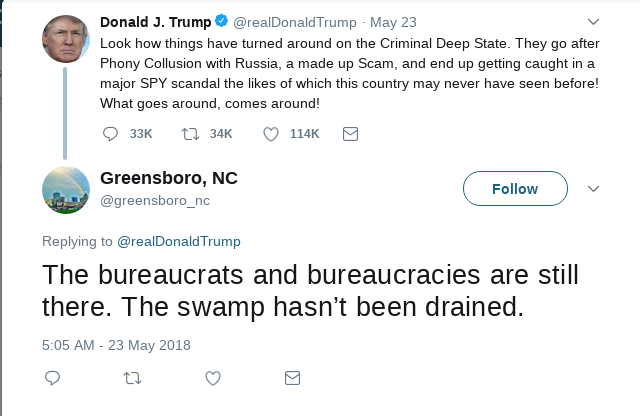 In addition Senator Richard Burr follows these accounts. Does he know they are fake? 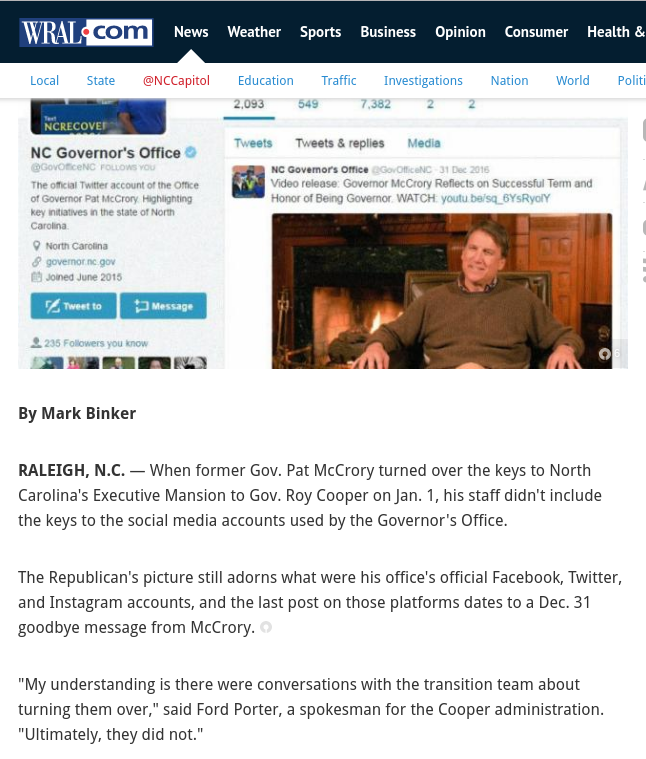 ￼To further complicate social media messaging for North Carolina, the outgoing GOP governor Pat McCrory refused to hand over the official state social media accounts to the current Democratic governer Roy Cooper. This sort of impersonation could have very real political impact. What if an official-looking account such as this one chose to endorse a political candidate? What if they published a false or damaging story about a Democratic candidate close to the midterms? What if they put up a fake announcement that county polling places are closing early? Or Democratic Polling stations were closed? What if they said the Mail in Ballots were not correct and new ones would be mailed out knowing that this would not happen? We always believe that when such time, effort and money is put into a project like this that there is an endgame, a reason. In this case we can’t afford to find out what it is. It isn’t a good one. Twitter has been negligent at the expense of honest discourse and our democratic process, in not suspending these accounts. Despite repeated complaints. Thats where all of us come in. We did it with Refy Botnet and we need to do it now. Please take the time and help clean this platform from this type of dangerous content. What to do? REPORT AND BLOCK. 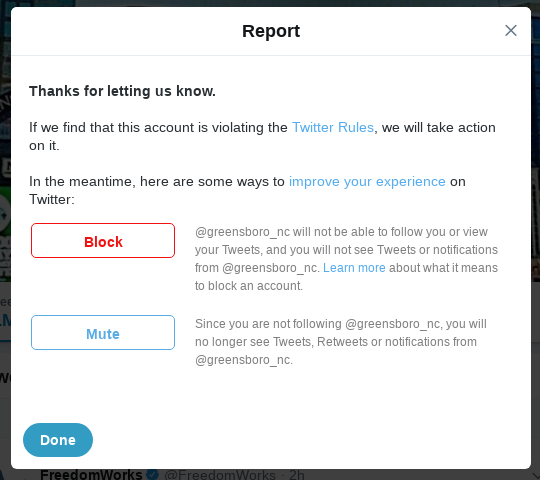 ￼It’s easy – go to the accounts listed and click on the “Report” link under the “More user actions” menu. That’s hidden behind the three dots at the upper right of the page. 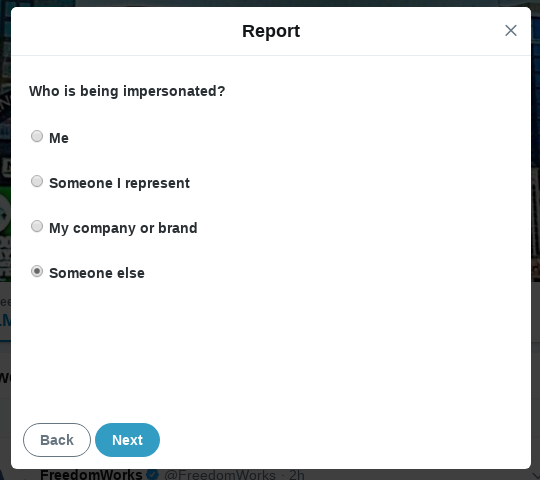 Choose “this account is pretending to be someone else”. Then block. We are putting a lot of resources behind trying to keep our Social Media platforms clean. We have a lot of findings that we will be posting. Just as all of you helped us get Reffy Bot removed we ask for your help again.We can’t afford these sites to be live through the midterms. We have a lot of work to do and we need your help.